Offering you a complete choice of products which include fluke 319 digital clamp meter. The Fluke 319 is designed with ergonomic concepts, shaped to fit your hand and to access tight spots easily. These small and rugged clamp meter is ideally suited for current measurements up to 1000 A (319) in tight cable compartments. 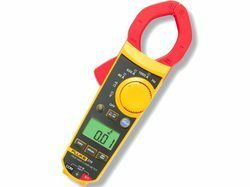 The Fluke 319 also offer AC/DC current measurements and have a higher resolution for loads below 40 A. In addition to a compact package with a strong feature set, the Fluke 319 also equips with In-rush current and Frequency functions for testing motors and lighting.